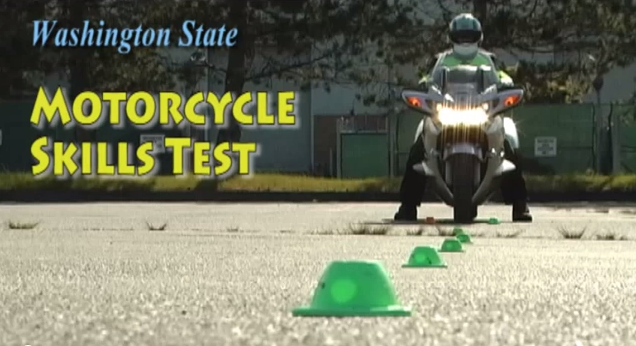 OLYMPIA—Washington state is leading the nation in the deployment of a new motorcycle endorsement skills test designed to better ensure riders are ready for hazards they will face on our highways. The Department of Licensing’s Motorcycle Safety Program worked closely with the national Motorcycle Safety Foundation (MSF) to design a new test that meets new federal recommendations including key motorcycle skills. One of these new riding elements tests a rider’s ability to handle curves. Through analysis of motorcycle crash data it was learned that the majority of riders were injured or killed in accidents that occurred in curves. While working with the MSF to design the test, DOL volunteered to introduce it in our state first to evaluate it before it is put in place nationally. The new test was introduced on August 1. Most states use tests and rider training curriculum created by the MSF and other states are expected to start using this new test in the spring of 2013. To support the new test, DOL has created a five-part video series demonstrating each element of the new test. In addition, these videos explain how the elements directly relate to the on-street skills necessary to deal with real-world riding situations. OLYMPIA—Starting August 1, most motorcycle riders seeking an endorsement to legally ride in Washington state will begin taking motorcycle knowledge and skills tests at approved motorcycle training schools across the state. The Department of Licensing will continue to offer these tests in the Colville, White Salmon, Ilwaco, Pullman, Coulee Dam, Clarkston and Walla Walla areas until motorcycle training schools expand services near these cities. DOL also will still test riders who have previously scheduled appointments at our offices. After passing the tests, customers will go to a licensing office to obtain their motorcycle endorsement. The cost of a motorcycle endorsement will remain at $25; however motorcycle training schools will set the fee they charge for the tests. This move is the first phase of implementing House Bill 1635, which gives the department authority to contract with private drive training schools, school districts and motorcycle training schools to conduct some knowledge and skills tests. The bill was passed in an effort to reduce wait times in licensing service offices. For a list of state-approved motorcycle training schools, go to: http://www.dol.wa.gov/driverslicense/motoschools.html. You are currently browsing the Licensing Express blog archives for August, 2012.